Last night I wasn't hungry at all, but I needed to eat . On a scale of 1 to 10, I felt 'negative 5'. All I had in the house was pasta, eggs, cheese and some basil that was questionable in age. 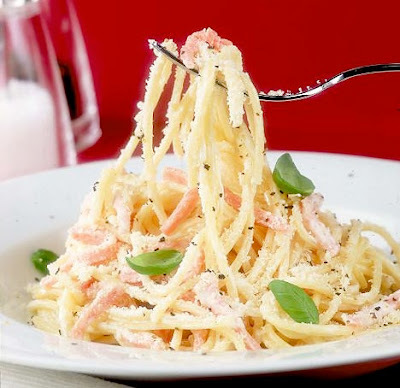 I have seen several Carbonara recipes that combines a raw egg and pasta. The heat from the pasta actually cooks the egg and creates a creamy sauce. Hmmm, interesting. Traditional Carbonara has thick bacon or pancetta. Since I didn't have anything that wonderful in my fridge, I called myself a vegetarian and enjoyed the bowl of pasta. I loved it. It was creamy without using cream. The cheese made it salty. Perfect for a crummy feeling evening. Comfort Carbonara serves 1 sick girl 1 serving thin spaghetti/Capellini 1 egg 1 ounce Pecorino/Parmesaan cheese Fresh basil leaves torn Salt/Pepper to taste 1. Place pasta in salted boiling water, and cook until tender. 2. Drain pasta and place in your favorite bowl. 3. Crack egg into separate bowl and whisk thoroghly. Pour egg over hot pasta. 4. Grate cheese on top, and tear basil leaves to finish. 5. Salt and pepper to taste. Stir together and enjoy.